Petition One MILLION Signatures for Major Immigration Reform NOW!! One MILLION Signatures for Major Immigration Reform NOW!! This is a petition to collect at least 1 million signatures of registered voters for Major Immigration Reform. Goal 1Million Sigs. I am doing this because it is needed; we need a Center Point for all of the Immigration Reform Groups. Also because before I was for Major Immigration Reform NOW!! (MIRNOW) I went down to the US/MX border in order to embarrass the US Government (by making a documentary about it) into completing the new walls, and enforcing the laws on the books. What I found after traveling on both sides of the US – Mexico border is that the walls we have don’t work, if the ones we have do not work, why put new ones up? Let's get a million signature please email this site to all your friends and let's stop the hate mongers and embrace our Latin Brothers and Sisters!! Also, we need to pass immigration reform and let more immigrants in legally (decriminalize them). That will stop illegal immigration as quickly as decriminalizing drugs will stop, or greatly reduce drug smuggling and take much of the profit out of both drug smuggling and people smuggling. Please indicate in the comments whether you are a registered US voter of not! Mexico, all of Central America, and South America (except Hugo Chavez) are our brothers and allies, not our enemies. If folks want to migrate to work - Let them!! Let's get a million signature please email this site to all your friends and let's stop the hate mongers and embrace our Latin Brothers and Sisters!! We Need To Build Bridges and a North/South Railroad from Rio De Janeiro to Juno, Alaska, NOT Walls!! See the web site atwww.bleedingborders.com for further convincing, buy the book in PDF format, see the sizzle reel that won 1st place in www.ifc.com Back to Basics Film challenge. Let's get a million signature please email this site to all your friends and let's stop the hate mongers and embrace our Latin Brothers and Sisters!! 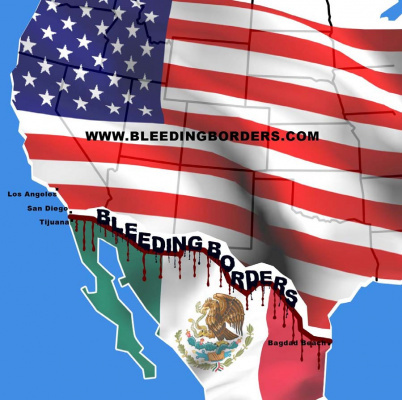 Sponsored by "Bleeding Borders" - a Documentary in Post-Production. When completed a portion of the profits from the film will be donated to all of the Deportee Camps along the Mexican-American Border!! This will go a long way to convince the brain washed right wing that we need our friends to the South, we do not need to push them away.